The orphans came from all over the vast city of Baghdad, Iraq. About 15 girls and 25 boys ages 10-18 arrived at 8am Sunday morning, 23rd June 2013, eager to seize the opportunity to engage in sport and games at a well-known sports club! They had never been afforded such an opportunity, both to enjoy the sports club facilities and to interact with experienced American PE teachers and coaches, including Brittany Wilkins, a former WNBA player! This sports camp was coordinated by GSP in partnership with MRDS, an NGO with a contract to teach English to children from a local orphanage. During the course of the 4-day camp, participants learned a variety of sports and games, such as basketball, kickball, softball, volleyball, ultimate frisbee, track & field, dodge ball and floor hockey. Boys and girls were separated in order to facilitate greater opportunity for engagement for each gender. It was delightful to see the girls abandon their apprehensions and grow increasingly involved as they enjoyed the camp! At the same time, the boys maximized opportunities for both encouragement in skill development and healthy competition. The lessons learned by the campers were enhanced as the coaches incorporated not only sports skills, but applicable life skills in their instruction. Each day emphasized a new life skill, ie, Teamwork, Sportsmanship, Discipline and Victory. While it took the collaboration of many to make this camp possible, the success of the camp was largely due to the diligent efforts of the GSP Baghdad young leadership team, who worked alongside the American coaches. This team of 12 young men and women rose energetically to the occasion, taking responsibility and ownership, and showing themselves to be competent, capable leaders! It was invaluable to have their cultural and Arabic abilities, as they interacted with the children in a way that magnified the overall vision and passion of the GSP American coaches. In fact, this passionate vision is so engrained that the GSP Baghdad team is now pursuing further opportunities to work with these disadvantaged orphan children! GSP continues to reach out to Iraqis through sport, whether training young people to be leaders, promoting vision, passion and responsibility, or teaching and encouraging children on the playing field. 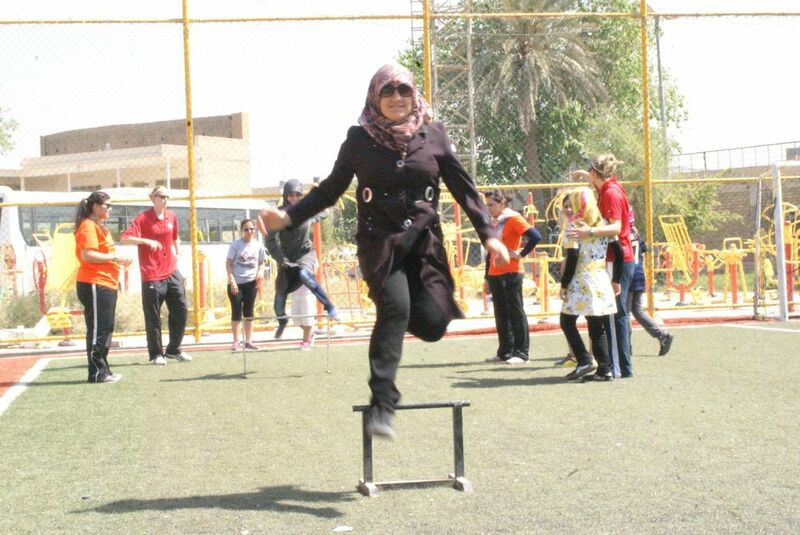 This is purposeful sport for development, engaging and impacting the future of Iraq, inspiring young leaders and providing unique opportunities for all to participate.